Classic Creamy Sweet Fudge, with a White Chocolate Twist – easier than you think to make, utterly irresistible when eating! Last week I reposted my recipe for my Oreo Cookies & Cream Fudge, and it went down and absolute storm again with so many of you making it this weekend! Thank you! 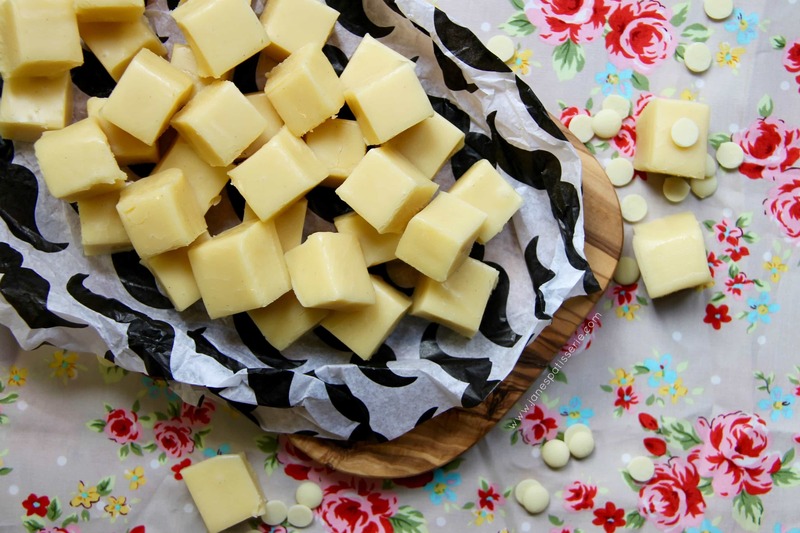 Because of this, I decided I couldn’t wait any longer to post my new recipe – this delicious White Chocolate Fudge!! I have made many a fudge recipe in my time, some ending up grainy, some not setting at all, and some being downright strange – but this one is creamy, delicious, the perfect soft:hard ratio, and is utterly scrumptious. HELLO HEAVEN! I know you lot like White Chocolate is a good’un as you all seem to love my No-Bake White Chocolate & Strawberry Cheesecake, and I have to agree – even thought White Chocolate isn’t technically Chocolate when you look into it (shocking, I know) it can be so creamy and lovely that it doesn’t bother me in the slightest. The mix of the Vanilla Bean Extract & White Chocolate in this fudge is perfection. I use Callebaut in my baking as it is of such high quality – and it ends up being the same price as cheap chocolate chips from the supermarket – Callebaut chocolate is heaven! It makes every recipe you use them for absolutely FULL of the Chocolatey heavenly flavour, and using that in this fudge is ideal. I realise Fudge can be scary, as I’ve said before, but it is so worth the scary moments, and its so worth investing in a sugar thermometer (which are relatively inexpensive these days!!) So you don’t have to worry, you’ll want to make fudge again and again once you’ve made it the first time – so I hope you like this recipe! Let me know how you get on! This recipe makes 40-50 pieces of fudge! 1) Line a 20cm Square pan with parchment paper and leave to the side. 2) In a Large Pan, add the Cream, Caster Sugar, Liquid Glucose & Vanilla – Heat on a low-medium heat until the sugar has dissolved, stir occasionally during this process so everything is mixed well – this could take a couple of minutes. 3) Once the sugar has dissolved, turn the heat up to a medium-high heat and bring the mixture to a rolling boil – without stiring the mixture, heat the mixture on the rolling boil until it reaches 113C – Test this with a Sugar Thermometer, or use the Soft Ball Method**! Be careful not to heat it too high, or be impatient with it, because you risk the mixture over spilling, and doing it to quickly can burn the mixture. 4) Once you have reached 113C, Remove the pan from the heat, and beat in the chopped white chocolate and butter until they’re melted and the mixture is smooth. Continue to beat for a couple of minutes so it thickens slightly! Pour into the prepared tin and leave to set for 5-6 hours, or overnight. 5) Chop into squares, I usually do 1inch squares and ENJOY!! This treat will last 2-3weeks in an airtight container at room temperature! If you don’t have a sugar thermometer, you can see if the fudge is ready by dropping a little into a cup of cold water. If a soft squeezable piece of fudge is formed, it is ready. But BE CAREFUL – it is EXTREMELY hot! P.S. Yes, that is Moustache patterned tissue paper!! Older Next post: No-Churn Salted Caramel Ice-Cream! Newer Previous post: Coconut Loaf Cake! These look incredible and you make it sound so simple. I have lost many a pan to an impatient chef (ME!) overboiling and burning the mix. These do look delicious though. I am almost tempted to try it again..
Hahah yes, its so tempting to hurry it along but it goes so so wrong 😛 and yes please do try it – let me know how you get on! 🙂 and thank you! Awwh haha thank you again!